Here's a first beta version of Sweet Home 3D 5.5. - The 0° / 45° / 90° radio buttons in the texture choice dialog box were replaced by a spinner to choose any texture angle. 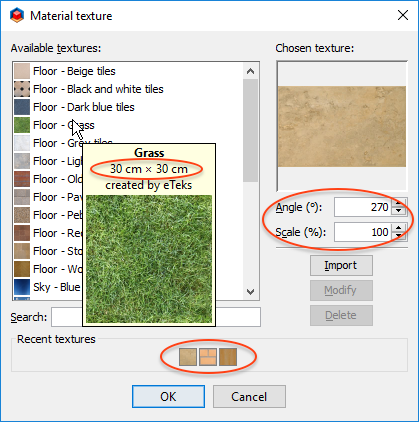 - A Scale field was added to this dialog box to reduce or enlarge the default size of a texture (now also shown in the information tool tip of a texture). This may be handy when a texture is applied on a shape with texture coordinates you can't change, or if you want to alter the default size of a texture coming from a textures library. - The list of recently used textures is now saved from a session to another. - Doors and windows now always cut out both sides of straight or round walls when they are parallel or tangent to them, whatever their depth is (but non-rectangular cut out shapes are still not supported in round walls). To avoid changes in your existing designed plans, this will work only for newly added doors and windows, except for service hatches that will continue to dig walls if their depth is smaller than wall thickness (the Service hatch piece has a new doorOrWindowWallCutOutOnBothSides property set to false). When magnetism is active, a door will be automatically placed in the middle of a round wall, but without being resized. - The width and depth of an open door can now only be proportionally changed to avoid unrealistic results on thick walls. When placed on a straight wall, this kind of door will now be magnetized either on the left or on the right side of the wall without being resized, depending on where you place the mouse pointer (this is the case only for the open door in the default library for the moment, but I'll add the new doorOrWindowWidthDepthDeformable property to other 3D models in the free libraries when version 5.5 will be released). - I added the new Plan > Join walls that will join the free ends of the two selected walls at their intersection point, thus without changing the direction of the walls. As many beginners seem to have problems to close a sequence of newly created walls, it's also possible to join walls when there are more than two walls in the selection, and the new menu item will be disabled only in the case selected items contain more than two walls with free ends or if they contain no wall with a free end. If the walls to join are parallel, it will work only if they are on the same row and in which case the first selected wall end will move to join the free closest free end of the other wall. If the selection contains only one wall with free ends, its closest end to a wall will be moved to this wall. - The Wall creation tool is now able to add only the missing walls around a room when you doucle-click in a room. This should make it easier to create the rooms of a whole house one after the other when you know their inner dimensions. - I added the Creator and Model size items to the Plan > Display column and Plan > Sort by menus, to be able to handle this information in the furniture table. I still wonder what the Model size of a group should display (the sum of the children items sizes wouldn't really make sense in case a group contains more than one item of the same kind, like chairs or boxes), and how such rows should be sorted when the furniture list is sorted by model size. 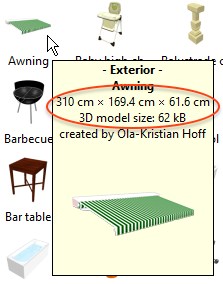 To let you choose a furniture model from its size, I also added the model size and its default dimensions to the information tool tip of a piece of furniture of the catalog. - For newcomers and any one looking for ideas, the new New from demo item was added to the File menu. 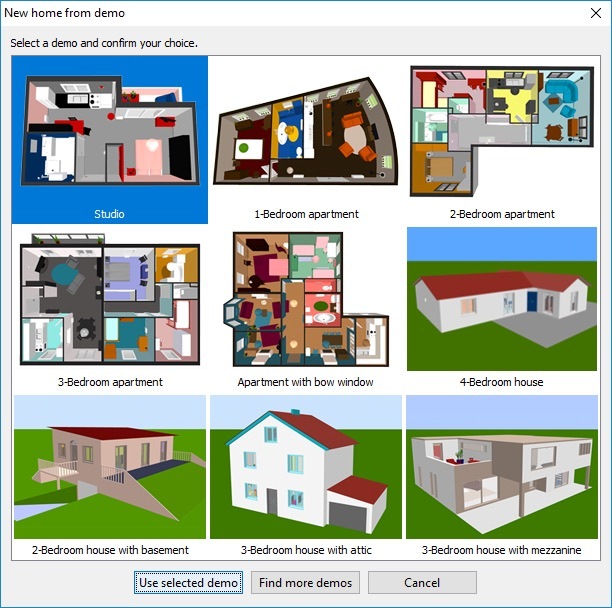 This item shows a dialog box proposing nine different demos designed by Véronique, our great community manager. To avoid any potential problem with textures (and let you improve them at your taste), the demos use only colors. They also reference only 3D models of the default library to prevent Sweet Home 3D size to grow too much. These demos are available under CC-BY license as well as all the GNU GPL 3D models of the default library which are now available under two licenses. The header of these 3D models was updated accordingly whereas many models were optimized to reduce the size of their file, and 5 new models were added (a flat TV, flowers, an upper cabinet, a front door and a bed with sheets and pillows). - It's now possible to choose the size in pixels of 3D model icons in the plan with a new preferences setting. From the default size 128x128, you can go up to 1024x1024, but be aware that using larger icons will make the program use much more RAM. - Frustrum front and back distances are now computed differently to avoid a too far front distance at higher levels or a too close back distance when objects are added very far. Of course, I didn't find any miracle solution, so there might still be plans where the new solution won't work perfectly. - I fixed an issue when a texture was displayed upside down. - I fixed the file dialog issue which appeared under Windows 10 Creator update. Wow, you have been busy. So many issues addressed! Looks like very good solutions, too. Congratulations, and will be looking forward to trying. PS Only shame the builders finished this week; I will have to start a new project, my better half will be thrilled. Wow, I really like the Scale feature for textures. Excellent! Also the Join Walls works better than the Connect Walls from the AdvancedEdit plugin. Good new, I've downloaded the jlnp file in the given link and after ??? bdfd, you just have to install Java and double-click on the the JNLP file. Spent half an hour or so working my way through (most of) the new features and models this morning (have yet to test some of the wall-joinings and doorOrWindowWallCutOutOnBothSides / doorOrWindowWidthDepthDeformable). First, I really like what you have done. Solutions are clever and work well. Could not find anything that did not work as described. My greatest concern with any software upgrade, is whether (often not very important) features are added at the cost of speed/interface. This it seems, you have avoided. Tested on the tablet (Atom Z3740 @ 1,33 GHz, orig config, Win8.1), i.e. a relatively slow machine. No noticeable performance reduction/problems. Especially appreciate the extra information indicating size / creator: size for convenience and an easy way of avoiding bloating a home (and removing performance reducing objects), creator as it makes sense when CCBY models are used. The find more demo homes is an interesting option, not only for demo/user guidance, but also possibly as a platform for distributing real homes (yes, I see possible legal implications, but it is a nice thought, maybe one I can try on an architect friend). PS First attempt trying round walls, cutouts, the 3D window at some point stopped updating moving furniture. Not able to reproduce. Has (I think) also happened once or twice with earlier releases, so it may be a one off. Sent you a screendump. I really love the way we can now adjust, precisely and very quickly, the textures. It changes my life! Very happy with latest extensive update. Thank you. Most interesting feature, which can significantly improve display (and print/export?) of a plan. Did not come across any issue at all when experimenting with the different icons (so in terms of beta-testing, the below is not important). In fact, the feature worked perfectly. Increasing to 1024×1024 (temporarily) could really improve 2D view (e.g. thread 7832). Model icons are generated by SH3D when opening a home (or importing a model), and if that is right, will larger icons impact performance? It seems that increasing the icon size can take a few seconds (less so when decreasing), but not dramatically. And once the gray clocks vanished, I could not notice a performance loss (but I did not max out the RAM, I rarely do). 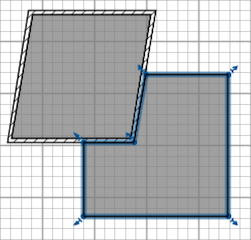 Increasing model icon size will not change an existing custom planIcon (which will be saved with the home)? Tried a custom planIcons with odd size 78×43 (awning , same proportions as model) that seemed to work well. But for custom planIcons is it better to use square .pngs or does it not matter? Wondering whether, in a future version (not priority), it would be difficult/possible to support custom SVG planIcons. Think this has been discussed and that SVG icons might impair performance. In another context I tested pulling 100 SVG files as images in html. Both IE and Opera displayed the page with no noticeable delay. Only at 100+ svg images (many animated) there was a quick blink before images became visible on a slow computer. The only thing I would suggest, is considering a keyboard shortcut to access preferences. I find myself opening preferences a lot already (to change new wall/floor settings mostly), and will may toggle icon size quite frequently too. Anyway, great feature. No problems. Happy. And happy 14th of July. My greatest concern with any software upgrade, is whether features are added at the cost of speed/interface. Don't worry it's my main concern too. But as I could have forgotten some special cases, I appreciate that you double-check, especially on a slow machine. I was worried about how to retrieve the size of 3D models in existing homes and libraries, but I finally find a fast way to explore the entries in a zip file. Managing doors and windows that cut out both sides of walls is a more heavy operation, but the difference should be very little. 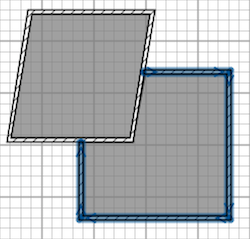 About the new icon size in preferences, the top views of 3D models used as icons in the plan are not saved in a sh3d file, except if that top view was precomputed and used in the pieceIcon# property of a piece of furniture. Thus, these icons are generated by Sweet Home 3D when opening a home, and generating larger icons should slow down the program a little. Images set in the planIcon# property of a piece don't have to be square, and will be always resized to the size of the piece in the plan. I don't know how much work would be required to add support for SVG for plan icons or background images. Sweet Home 3D supports only SVG Paths at the moment, but I guess Batik must also be able to convert SVG data to the needs of a Java graphical program like Sweet Home 3D. My main concern would be about performances, because drawing a SVG will run slower than drawing an image most of the time. I'll check how difficult this task is in the coming days. I wouldn't mind to add a shortcut for preferences under Windows and Linux (under Mac OS X, it's cmd + , ). I just don't know which one is commonly used under those systems. Any suggestion?